Welcome to the home of OpenMPT! OpenMPT is a popular tracker software for Windows. OpenMPT (short hand for Open ModPlug Tracker) is completely free and allows you to create and play back some great music on your computer. 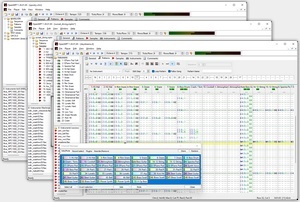 Based on the original ModPlug Tracker written by Olivier Lapicque, OpenMPT is free software, can import a wide variety of module formats and offers an intuitive, native GUI as well as advanced features such as VST plugins and ASIO output. In addition to its own song format, OpenMPT can natively edit Impulse Tracker, FastTracker, Scream Tracker and ProTracker module files. Read more about it on the features page! libopenmpt is a cross-platform C++ and C module playback library. It is based on the player code of the Open ModPlug Tracker project. It offers high-quality module playback on a variety of platforms. If you want to stay up-to-date, you can subscribe to our RSS feed. Releases and other interesting changes will be announced through this feed. Alternatively, you can also follow us on Twitter.